, a learned divine, was born in 1696 at Wemb worth in Devonshire, of which parish his father wag rector. The first part of his grammatical education he received at Okehampton, and the remainder at Ely, under the rev. Sam. Bentham, his first cousin by the mother’s side. Such were the proofs which young Burton afforded at school of his capacity, diligence, and worthy dispositions, that the learned Dr. Ashton, master of Jesuscollege, Cambridge, designed to have him admitted into his own college. But in the mean time, Dr. Turner, president of Corpus-Christi college, Oxford, having made an accidental trial of Mr. Burton’s literary improvements, procured him a scholarship in that college in 1713, when he was 17 years of age. Here he made so distinguished a progress, that Dr. Mather, the president, appointed him to the important office of tutor, when he was only B. A. Soon after, the college conferred upon him the honour of reading the Greek lecture. During the whole course of | his studies, he recommended himself both to the affection of his equals and the esteem of his superiors. Dr. Potter, in particular, at that time bishop of Oxford, conceived a great regard for him. 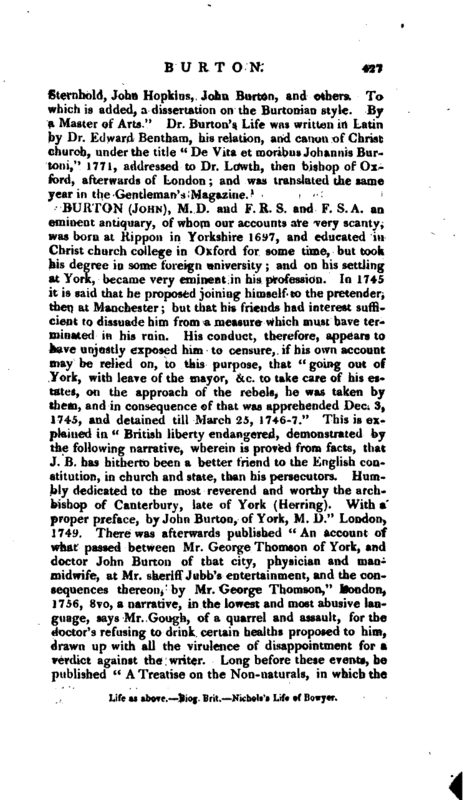 March 24, 1720, Mr. Burton was admitted to the degree of M. A. In the exercise of his duty as a tutor, no one could exceed him in attention, diligence, and a zealous concern for the improvement of his pupils. As he was himself unacquainted with mathematics, and ignorant of the Hebrew tongue, he took effectual care that the young men under his tuition should be well instructed in these points. With regard to those of his pupils who were upon charitable foundations, he was solicitous that the acquisition of knowledge should be rendered as cheap to them as possible; and was so disinterested and beneficent in the whole of his conduct, that, after having discharged the office of a tutor almost fifteen years, he was scarcely possessed of 50l. when he quitted the university. 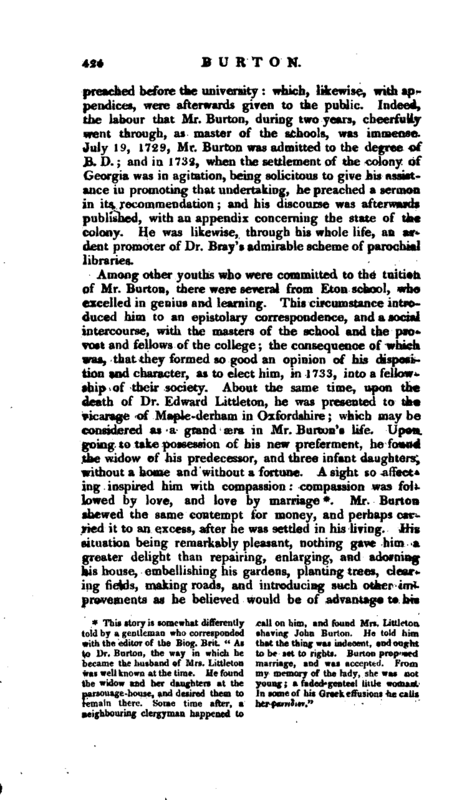 In revising, correcting, and improving the exercises of the students, Mr. Burton displayed surprising patience and indefatigable diligence; and there are still extant his themes, declamations, orations, and poems of every kind, which he composed for the use of his own pupils, and even of others. His attention was also laudably and liberally directed to the restoration of the credit of the university press, and to enable editors to carry on their literary undertakings with diminished expence. 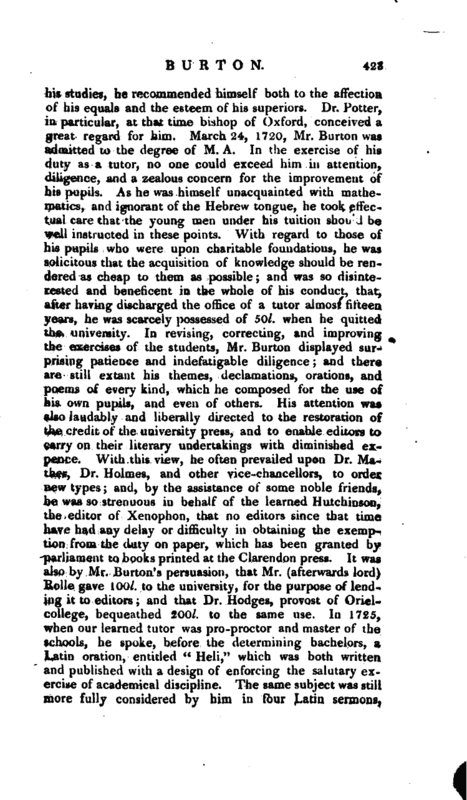 With this view, he often prevailed upon Dr. Mather, Dr. Holmes, and other vice-chancellors, to order new types; and, by the assistance of some noble friends, he was so strenuous in behalf of the learned Hutchinson, the editor of Xenophon, that no editors since that time have had any delay or difficulty in obtaining the exemption from the duty on paper, which has been granted by parliament to books printed at the Clarendon press. It was also by Mr. Burton’s persuasion, that Mr. (afterwards lord) Rolle gave WOl. to the university, for the purpose of lending it to editors; and that Dr. Hodges, provost of Orielcollege, bequeathed 200l. to the same use. In 1725, when our learned tutor was pro-proctor and master of the schools, he spoke, before the determining bachelors, a Latin oration, entitled “Heli,” which was both written and published with a design of enforcing the salutary exercise of academical discipline. The same subject was still more fully considered by him in four Latin sermons, | preached before the university; which, likewise, with appendices, were afterwards given to the public. Indeed, the labour that Mr. Burton, during two years, cheerfully went through, as master of the schools, was immense. July 19, 1729, Mr. Burton was admitted to the degree of B. D.; and in 1732, when the settlement of the colony of Georgia was in agitation, being solicitous to give his assistance in promoting that undertaking, he preached a sermon in its recommendation; and his discourse was afterwards published, with an appendix concerning the state of the colony. He was likewise, through his whole life, an ardent promoter of Dr. Bray’s admirable scheme of parochial libraries. The causeway through the marsh at Woodbridge, in the road from the north part of Surrey to Guildford, which was begun by his advice and assistance, and finished by his contribution and that of his friends, will be a lasting memorial of his judgment and industry on such occasions. Part of his leisure hours at Maple-derham was employed in collecting hints for removing obstructions in the navigation of the river Thames. These hints he formed into a pamphlet, entitled “The present state of the navigation of the river Thames considered, and certain regulations proposed,” 1765, 4to. A second edition, with an Appendix, was published in 1767. Works of a similar kind were undertaken by him, when in 1766 he was instituted to the rectory of Worplesdon in Surry. In 1748, the death of his wife affected him in the tenderest manner, as is evident from the several parts of his “Opuscula metrico-prosaica;” but did not lessen his regard for her three orphan daughters, towards whom he continued to exert the greatest affection and liberality. After this event, he spent the principal part of the year at Eton-college; where he gave himself entirely up to the study of literature, and the assistance of his friends; but punctually attended any public meetings on literary or ecclesiastic affairs, whether at Oxford, London, or Cambridge. July 1, 1752, he took the degree of D. D. and afterwards published his lectures on that occasion. He was intimately connected with many of the bishops; and whilst caressed by the governors of the church, was equally dear to the lowest of the clergy. Nothing was more agreeable to him, than to see all around him easy, cheerful, and happy. To such of the young scholars at Eton as appeared so be of promising abilities and dispositions, he shewed a particular attention, made them the companions of his leisure hours, and afforded them every encouragement which lay in his power. 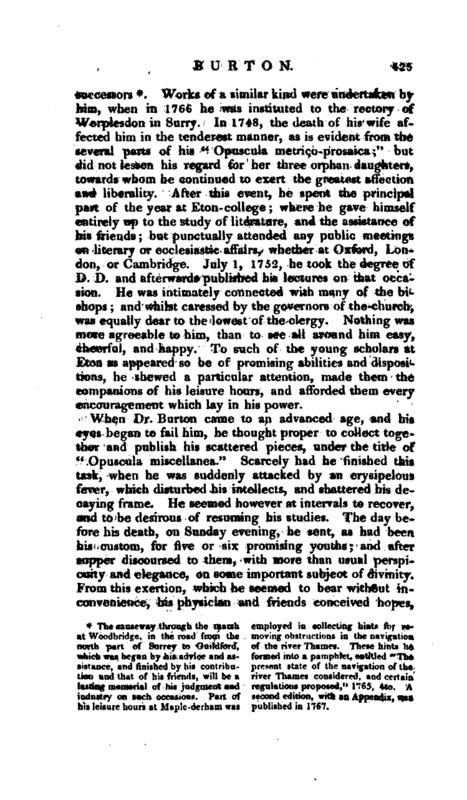 When Dr. Burton came to an advanced age, and his eyes began to fail him, he thought proper to collect together and publish his scattered pieces, under the title of “Opuscula miscellanea.” Scarcely had he finished this task, when he was suddenly attacked by an erysipelous fever, which disturbed his intellects, and shattered his decaying frame. He seemed however at intervals to recover, and to be desirous of resuming his studies. The day before his death, on Sunday evening, he sent, as had been his custom, for five or six promising youths; and after supper discoursed to them, with more than usual perspicuity and elegance, on some important subject of divinity. From this exertion, which he seemed to bear without inconvenience, his physician and friends conceived hopes, | though mistaken ones, of his recovery; for after a most serene sleep, he quietly departed this Jife the next morning, Feb. 11, 1771, aged 76, and was buried at the entrance of the inner chapel at Eton. 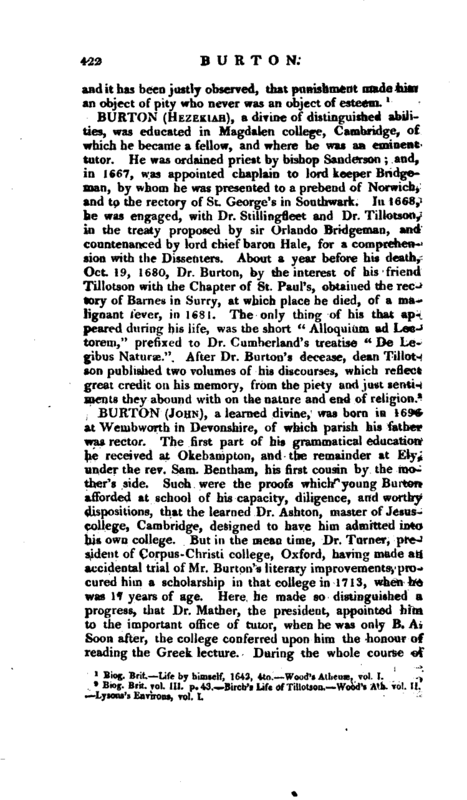 Dr. Burton had some peculiarities of character, which wit or envy were accustomed to magnify; even his style, which is rather precise and pedantic, has been considered as peculiar, and called the Burtonian style; but his acknowledged virtues and talents were such as to entitle him to the serious regard of the majority of his contemporaries^ His works, some of which we have already noticed, consist of two volumes of occasional “Sermons,” 1764, and 1766, 8vo; his “Opuscula Miscellanea Theologica,” and his “Opuscula Miscellanea Metrico-prosaica.” Of these a very elegant poem, entitled “Sacerdos Parrecialis Rusticus,” has been recently (1800) translated by the Rev. Dawson Warren, under the title “The Parish Priest, a poem,” 4to. 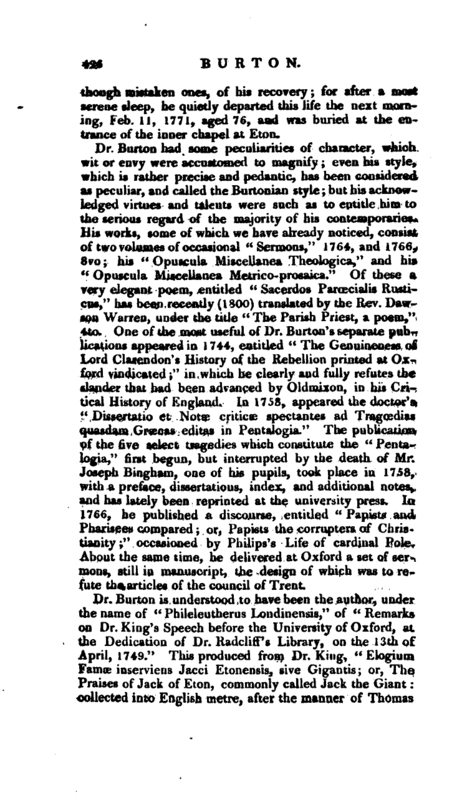 One of the most useful of Dr. Burton’s separate publications appeared in 1744, entitled “The Genuineness of Lord Clarendon’s History of the Rebellion printed at Oxford vindicated;” in which he clearly and fully refutes the slander that bad been advanced by Oldmixon, in his Critical History of England. In 1758, appeared the doctor’s “Dissertatio et Notae criticae spectantes ad Tragoedias quasdam Graecas editas in Pentalogia.” The publication. of the five select tragedies which constitute the “Pentalogia r” first begun, but interrupted by the death of Mr. Joseph Bingham, one of his pupils, took place in 1758, with a preface, dissertations, index, and additional notes, and has lately been reprinted at the university press. In 1766, he published a discourse, entitled “Papists and Pharisees compared; or, Papists the corrupters of Christianity;” occasioned by Philips’s Life of cardinal Pole. About the same time, he delivered at Oxford a set of sermons, still in manuscript, the design of which was to refute the articles of the council of Trent. Life as above. —Biog. Brit.—Nichols’s Life of Bowyer.